Over the past three months the cities of Angkang, Hanzhong and Shangluo have been worst affected. 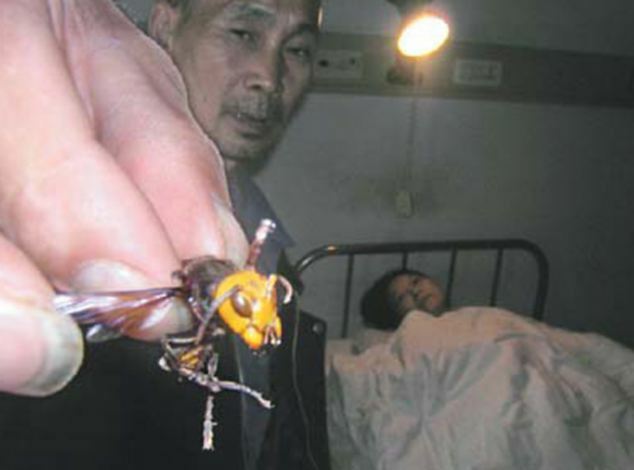 The Chinese term for hornets is 'hu feng' and local experts believe the culprit is the Asian giant hornet or Vespa mandarinia, which grows up to 5cm long with a 6mm sting. The insects' highly toxic stings can lead to anaphylactic shock and renal failure. Authorities have mobilised a special medic team and trained more medical personnel to treat victims. An Ankang official told Xinhua that firefighters have been removing hornet nests. The provincial government said hornets are most aggressive in behaviour when they mate and migrate in September and October. The dry and warm weather this year has contributed to the ferocity of attacks. One of the victims, named only as Mu, said she has spent two months in a hospital undergoing 13 dialysis treatments. She has 200 stitches, but still can not move her legs. She told Xinhua, the Chinese state-run news agency: 'The hornets were horrifying'. sudden I was stung and I couldn't move. 'It's very difficult to prevent the attacks because hornet nests are usually in hidden sites,' he said. 'The venom of an Asian giant hornet is very special compared with other hornets or yellow jackets,' he warned. 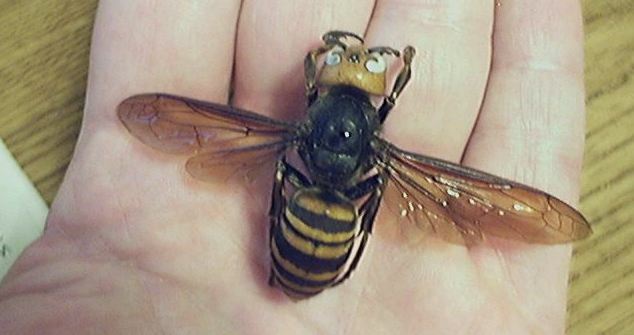 Meanwhile fears are growing that giant Asian hornets are headed for Britain. The species is four times the size of our native honeybees and has decimated the bee population in France. delivery of Chinese pottery from the Far East in late 2004.
couple of hours, honey production has plummeted. It has colonised 39 of France’s 100 administrative departments. so exhausted that the hornets can move in and ransack it. before making off with the 'meat ball' to feed their young. makes their hives more vulnerable to disease. "Groups of Asian hornets hover in front of a beehive, picking off single honeybees, decapitating them and stripping off their wings and legs before making off with the 'meat ball' to feed their young." So basically the same thing a wife does to a cheating husband?